It’s easy to fall into bad habits. Coffee, shopping, men, late-night TV, nail biting, smoking, impulsive spending, littering and general laziness. I’m sure we could build a huge list together if we tried. We’ve all got our bad habits and our vices, and falling into that rabbit hole seems to take no effort whatsoever. My bad habits? 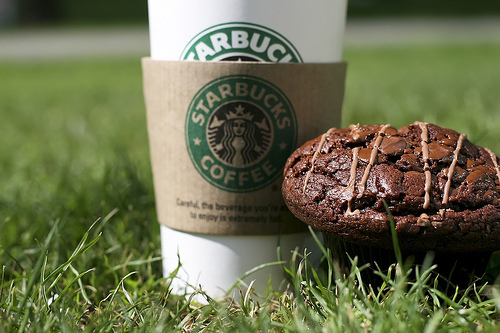 I have had a daily Starbucks habit of one grande americano and one muffin. It dinged my bank account of $4.57 each morning, which to me seemed like pocket change. I was spending almost $100 every month on java beans, water and (fattening) muffins. Not only that, most days out of the week I was buying my lunch, so at about $6 per day and 3 days per week, that’s close to another $100 a month. Laziness is an all-consuming slippery slope. Why get up 10 minutes early in the morning to make my lunch when I can sleep for those extra 10 minutes? I made a choice to make an effort to change that pattern. If bad habits are so easy to fall into, shouldn’t good habits be just as simple? Bringing lunches to work, getting to the gym on a regular schedule, drinking tea at the office instead of hitting up Starbucks, making concious decisions about what I need to buy and being honest with myself about what I don’t really need… shouldn’t I be able to implement these habits with just as much simplicity? Shouldn’t what’s smart be just as easy to make routine? I’ve cut back to one Starbucks trip per week (plus my trainer told me that cutting out caffeine will help me lean out even more) and limit myself to buying my lunch only on Fridays. The best part? I don’t sweat about the number in my bank account anymore because it’s not getting dinged on a daily basis. Your say: What are some of your bad habits that you’d like to curb into good habits? How would you make those changes in your life? I recently went through a similar exercise. Every morning I’d buy my breakfast at work: an english muffin with egg and cheese plus a bottle of OJ. This comes out to about $4.40 which is very close to your coffee/muffin habit. Also, for a while I had also been buying lunch at work. This averaged out to about $5-6/day. It just all adds up! So just to see how it works out, I planned one week where I’d try to have breakfast at home and brought lunch from home. It seems like the state of the economy is making a lot of people re-think their spending as I also went through the same exercise not long ago. I had fallen into the same bad habits both you and Eva describe. I was buying my breakfast and lunch at work 5 days a week then wondering why my bank account was tight and I had to budget extra-carefully on the occasions I *did* decide to go grocery shopping. I’ve forced myself into a new pattern and it’s working well. On Wednesday or Thursday evenings I sit down and plan out a menu for the next week. I plan it carefully, making sure that it is balanced and healthy but also lends itself well to leftovers. So I’m not bored eating exactly the same thing each day, I try to do things like marinate double the chicken I need overnight then have one portion for dinner with rice or potatoes and veggies but also make sure I have salad or sandwich fixings on hand so the rest of the chicken can be used for lunch the next day but prepared differently to avoid the boredom factor with homemade lunches. I also make a big batch of hummus every weekend since it keeps well so I can bring that with mini pitas and veggies on certain days. My other trick – though this depends on the set-up of your office and how trustworthy your coworkers are – is that I make sure to keep the fixings I need for breakfast at work so I have no excuse to buy. On the weekend I buy bagels or a loaf of bread that I can bring in on Monday. I keep jars of almond butter and jam in the fridge and also make sure my weekend grocery trip includes fruits that are easily portable like bananas and apples. Cereal is also a good one to keep at the office since the box can easily be tucked in a desk drawer if your office has a pesky “items disappear from the fridge” problem. I too am kicking my morning commuting habit. Granted it used to be worse than it was now. I used to buy a Starbucks/Delaney’s/Blenz drink on a daily basis in the morning $5/morning adds up! Now I only buy on wed/fri when I am commuting to the office. That is stopping today too. Not only for $$$ reasons, but also because it really isn’t good for me! that $5/day or $10/week morning treats will now be paying for me to hit the gym! I presume the money you are saving is going towards paying for a trainer? Hooray for cutting caffeine! I cut caffeine completely for 2 months and now I drink a decaf coffee once in a while. My worst habit is the time I *waste* on the computer. I’d like to limit it to time spent being productive, creative, or compassionate. My addiction to computer games does not help. Shutting down the PC completely on evenings and weekends is a good motivator, since PC’s take a long time to boot up! Oh yeah, ditto Alissa. My compy is a huge time waster when I’m home alone. I go to turn on a tune while I knit or read and end up searching for recipes, photographs and many other useless things. I recently cut out my daily Starbucks tall vanilla latte ($3.47) and I feel so much better. I let myself have one once a week and I appreciate it so much more now. And I definitely appreciate the cash I’m not spending on over-priced coffee. @Jenny – My trainer is actually a girlfriend that is a professional trainer who works with me at no cost, but I appreciate the concern about my financial decisions. Under normal circumstances, it would be quite an expense. As a runner who always runs before breakfast I use my morning Starbucks as a reward for getting out and running every morning. I make sure I come home eat (shower of course) and then hit Starbucks after that. I not only don’t feel guilty but look forward to it. A good soloution is you don’t exercise you don’t get the Starbucks reward. Being a bachelor I find it hard to cook for just one person only. So whenever I make dinner, I usually make more so I’m left with about 2-3 meal worth of leftovers. These would go as my lunch for the week. So I’d cook 2-3 times a week and I’d have all the lunch I need for the entire week. Cooking is quite enjoyable and it’s good to know what you’re eating. In terms of bad habits… I’m with Alissa. I spend way too much time in front of computer. Hard to help it though. @j – Hehe… men are like red wine to me. Irresistable but inevitably get me in trouble. I am having a hard time kicking my coffee addiction…and I really don’t want to. Glad I never had the Starbucks habit…I’d be broke. Good for you for making all those cut backs! I also limit my eating out purchases to Fridays, except that it’s dinner that I get, not lunch. I make my lunches before I go to bed. I always sleep until the last possible second, so making it in the morning is not an option. My bad habit is nail biting. I’ve been doing well for the past week, but who knows how long that will last! I really need to stop all together, it’s really bad for my jaw. umm… confession… I asked Joe to put Ruthie to bed tonight so I could keep “working”. Um… but here I am…. So I would have to say quitting the habbit of interneting when I should be working/playing/parenting etc. would be ideal. Now I’d better go to my online banking homepage so that it shows up on the scroll-down bar in the browser. Kudos for kicking your habit. In all seriousness tho, it is great. I need to kick the Timmy’s and chinese fast food at Harbour Center and learn how to use the fridge in the kitchen that’s ten feet down the hall. Refillable mugs and the small coffee shops are the best. I can get better coffee at under half the price than what you get at Starbucks, being the black coffee drinker that I am. Plus you’re wasting less as well. Also, I’ve found this great chai green tea that you can get at Safeway or Save-On that are an amazing cost alternative as well. I’ve never been a coffee drinker so that wasn’t hard to quit, however I did have this diet coke addiction that I seemed to spend 5 – 6 bucks/day on and more on the weekends. It seemed like I was always drinking one. Apprarently it was the cafeine that I was addicted to and perhaps the Aspartame also. That being said, that since August I have been diet-coke free and although I went through a little withdrawl, lately I’m finding that water is quite a tasty alternative. Looking back it’s hard to fathom just how much diet coke I drank over the years and that in itself is a very scary thought. If you absolutely need to feed that morning caffeine addiction, then why not brew your own in the morning. With the money saved from not going to Starbucks, invest in a good coffee machine, espresso machine, or (love these babies) a super-automatic espresso machine that will grind the coffee, measure out the appropriate amount and then brew your espresso or cafe americano. All this with a press of a button! And you can steam/froth your milk too! Actually, http://www.espressoplanet.com/ is closer to your neck of the woods in the 604 area. Ack! Delete previous.. here’s the correct link for the other site.